It’s nearly impossible to walk through Princeton without recognizing the signs and symbols of the town. There are Princeton University’s signature black and orange colors, the tiger mascot, plenty of pi symbols, and of course, the famous Hoagie Haven t-shirt. While Hoagie Haven may not technically be a part of the PU campus, it’s certainly a culinary staple amongst the students. In fact, it’s a staple for anyone who’s ever craved fries, bacon, cheesesteak, mozzarella sticks, or any other deliciously indulgent and gloriously greasy food – all on a hoagie, no less. Hoagie Haven is indeed a sanctuary for those who might be slightly hung over, are ready to watch a football game, or are simply looking to consume some famously tasty food. Owned and operated by the restaurant-savvy Maltabese brothers, it’s no wonder that Hoagie Haven has fans spanning the country, if not the globe. For a little over 10 years, Michael, Nico, and Costa Maltabese have been doing their Uncle Haven proud by running the legendary hoagie joint he first opened in 1973. Starting out as a classic Italian eatery, Hoagie Haven came to its current fame after Haven decided he needed larger rolls that could fit all of the savory food options in his store. The results of this idea were foot long hoagies heaping with deli staples that quickly became a Princeton must-have. Fast-forward to 2015, and the Maltabese trio have maintained the shop’s excellence, while continuing to expand upon its eclectic hoagie menu – and its restaurant competition. 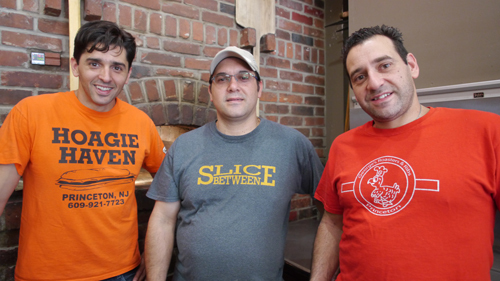 The Maltabese brothers not only own Hoagie Haven, but also George’s Roasters and Ribs and A Slice Between pizza that proudly sits between the two. It all started with the middle brother Nico who brought the Maltabese name to Nassau Street when he starting running George’s five years prior to taking over Hoagie Haven with his siblings. Growing up, helping their father run restaurants in their home state of Florida, the Maltabeses couldn’t resist moving into the space that was previously Old World Pizza three and a half years ago. While there’s a “guy” for each store, the Maltabese businesses are a result of their family efforts, and at times, their family tensions. According to Costa, the love and trust of his brothers outweighs all the negatives, but working alongside them can cause conflict at times. Despite periodic feuding, Costa proves loyal to his brothers responding, “no comment” when asked which brother is boss. In reality, all three “bosses” are also cooks, managers, cleaners, and any other title associated with the restaurant business, including costumer. 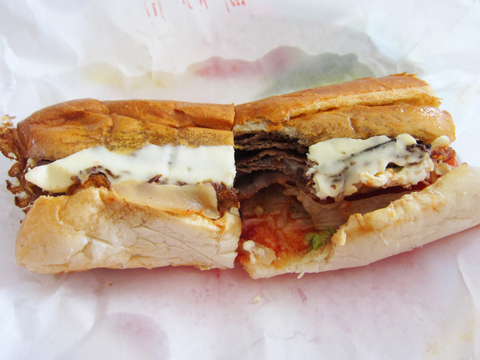 But when it comes to Costa’s favorite hoagies, he proves to be more of a traditionalist. He prefers classics like Chicken Parmesan to one of their more indulgent choices. Costa is one of few that will take something over a Hoagie Haven Phat Lady or Sanchez, their two most popular sandwiches. Complete with cheesesteak, mozzarella sticks, fries, ketchup, and hot sauce, the Phat Lady rivals the Sanchez that’s filled with a chicken cutlet, American cheese, mozzarella sticks, fries and Sanchez sauce. When it comes to that famous sauce, Costa can agree that nothing quite compares. In fact, Costa and his brothers are in the process of bottling their Sanchez sauce to sell starting this holiday season. While everyone knows the key to the Sanchez is in its sauce, it’s harder to pinpoint what exactly makes Hoagie Haven the premiere eating spot in Princeton. Whether it is the service, the sauce, or the stories formed while eating a late-night Sanchez, there’s something about Hoagie Haven that’s captured the hearts – and stomachs – of Princeton.